We’ve put together a fully-loaded guide to complying with LOLER ’98 legislation, and how Papertrail makes it so much easier to show thorough and regular maintenance of the lifting equipment that you need to inspect as part of LOLER compliance. Seriously, if you work in arboriculture, scaffolding services, construction, industrial window cleaning, oil and gas – or any other industry involving lifting and rope access equipment, this post is for you! Read on for the lowdown on how to make stressing over LOLER a thing of the past. First of all, what is LOLER ’98? The Lifting Operations and Lifting Equipment Regulations 1998 (LOLER) places duties on people and companies who own, operate or have control over lifting equipment. 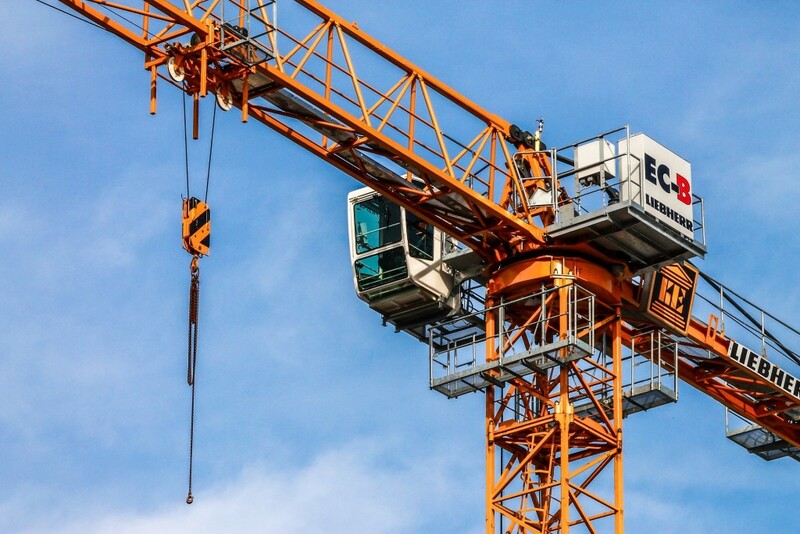 These duties include creating risk assessments for each piece of lifting equipment, and demonstrating maintenance of lifting equipment through making half-yearly inspections of equipment – checking that everything is in perfect working order, and retiring or replacing any faulty equipment. More on how Papertrail makes this process easy later. LOLER came into force on 5th December 1998 alongside the Provision and Use of Work Equipment Regulations (PUWER), intended to implement an EU directive with regards to the use of work equipment. There is an interesting overlap between LOLER and PUWER; because lifting equipment is also considered “work equipment”, anyone who has to comply with LOLER also has to comply with PUWER. Indeed, both of these regulations must be met with in order to comply with the HSWA 1974 (Health and Safety at Work etc. Act 1974). Look out for our article on complying with PUWER in the coming weeks – we can’t wait to share it with you! Who has to comply with LOLER? Anyone with responsibility directly or indirectly for work equipment and its use – for example, employers, employees, the self-employed and those who hire work equipment – has to comply with LOLER. Everyone who has responsibility for lifting equipment in their company needs to be aware of LOLER and the procedures in place that will secure compliance. Lifting accessories are pieces of equipment that are used to attach the load to lifting equipment, providing a link between the two. Any lifting accessories used between lifting equipment and the load may need to be taken into account in determining the overall weight of the load. Further details and examples of equipment covered by LOLER can be found in the Approved Code of Practice and guidance. The load includes any material, people or animals (or any combination of these) that is lifted by the lifting equipment. Loads are often provided with permanent or semi-permanent fixed or attached points for lifting. In most cases, these are considered to be part of the load. Now you know what kind of equipment falls under LOLER, you should also know whether or not you have to comply! Of course, depending on the type, some pieces of lifting equipment will need to be checked more regularly. For example, lifting chains and slings should be checked before every use, but lift trucks may only need to be checked on a monthly basis. 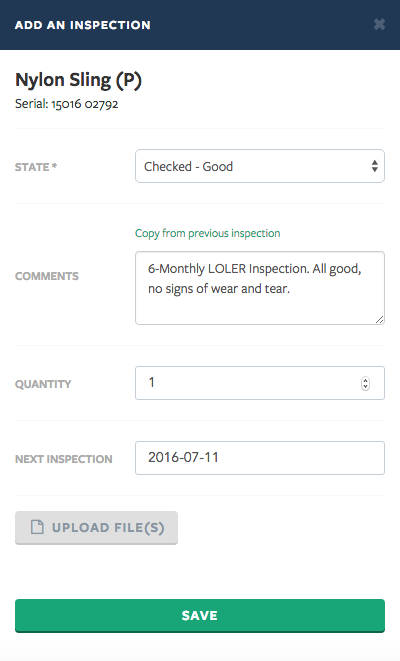 In any case, with Papertrail, you can set daily, weekly, monthly or 6-monthly inspection schedules for all your equipment, and get notified whenever another inspection is due – so you’ll never forget to make them! First, you need to have created an online record of the piece of lifting equipment you’re inspecting (it’s easy, just do this). After which, you’re ready to inspect! Consult the inspection guidelines provided by the manufacturer, and ensure you check each piece of equipment for wear and tear according to what’s stated. LOLER requires you to first assess the equipment visually, before performing functional checks. With some lifting equipment, traditional non-destructive testing and load testing may also be required as part of the process. If everything has been checked and is functioning normally, record the inspection like in the screenshot above, with the state of the equipment reading “Checked – Good”. You should also set the next inspection date for six months’ time – inspection frequencies can also be set up when creating the record. Now that’s been inspected and recorded in Papertrail, you can now navigate to the folder that contains the piece of equipment and create the required report. Click on the record, and once you have confirmed that the inspection information is correct, select the drop down arrow adjacent to the folder name and select ‘Print/Export’. Next, select the ‘PDF/OPEN’ option. This will bring up the report/certificate view that will be produced for you. No longer do you need a complex system of paper records or spreadsheets to comply with LOLER. Papertrail helps you manage, inspect and maintain LOLER equipment across your entire business.